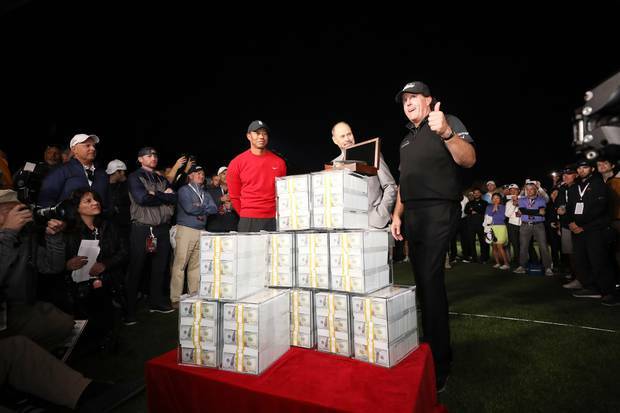 Phil Mickelson birdied the fourth playoff hole to beat Tiger Woods in their $9 million ($13 million NZD) made-for-TV match in Las Vegas. "You couldn't have made this event any better than it was," Woods said. "It was back and forth and very competitive on a golf course that was playing on the tricky side." Only 700 invited guests were allowed to watch the event billed as golf's first pay-per-view broadcast. It was marred by technical difficulties with viewers unable to view it on their televisions after paying $19.95. Turner and Bleacher Report representatives sent out links on social media allowing people to view it for free on their computers and mobile devices. Representatives from Turner didn't respond to requests from The Associated Press for comment. The match was billed as a chance for viewers to watch an untraditional golf broadcast as both golfers and their caddies were mic'd up. There was some banter between Woods and Mickelson early on but not much as the stakes increased.